Processing Imported Data - From Text File - Douglas Computing, Inc. Besides scrolling through the Sort Name list box, and manually identifying and deleting duplicate records, you can check the Show Duplicates check box on the bottom menu bar of the page, which allows you to identify each set of duplicate records. 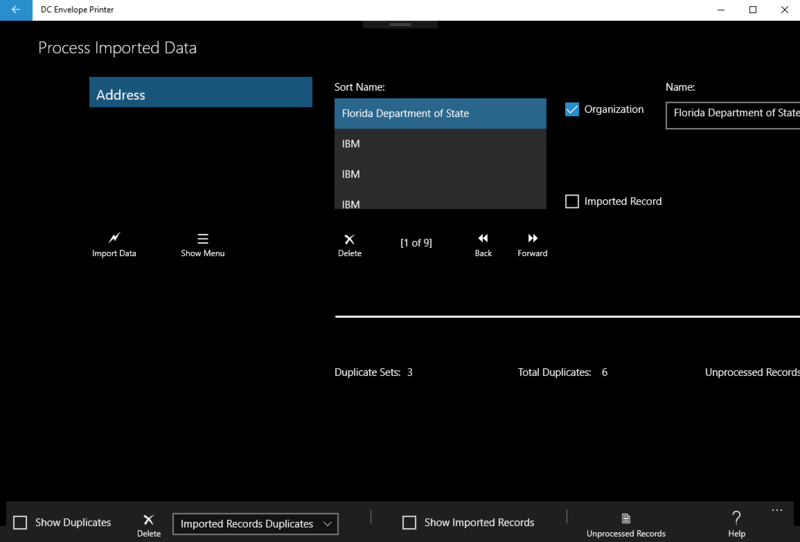 From this screen, you can move from one set of duplicate records to the next, and manually delete the records you want to get rid of. Another option you have to get rid of duplicate records, is to select an option next to the Delete button on the bottom menu bar, and then click on the Delete button. If you select the Imported Records Duplicates option, when you click on the Delete button beside it, all records you tentatively imported that are duplicates of copies of live records in the DC Envelope Printer, will be deleted. If you select the Original Records Duplicates option, when you click on the Delete button beside it, all copies of live records in your database, that are duplicates of imported records, will be deleted. 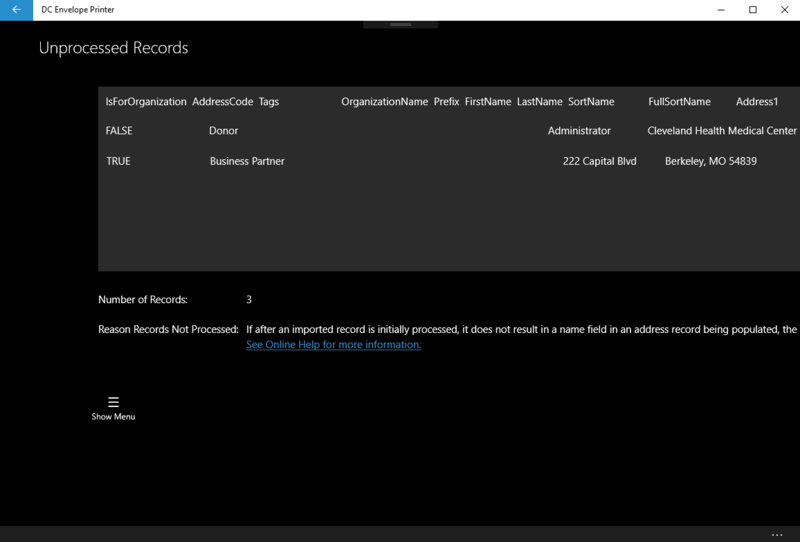 In order to fully import the records in the above screen, all duplicate record must be deleted. 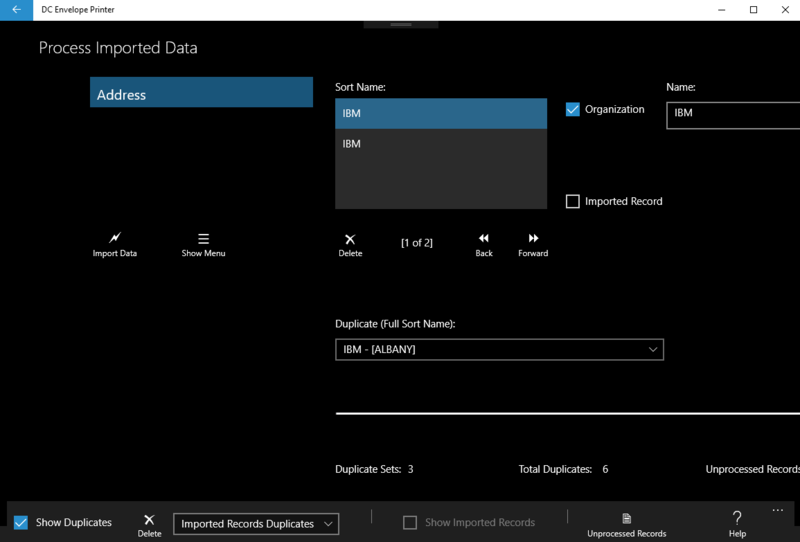 You can use the Duplicate Sets and Total Duplicates values displayed on the screen, to determine how many duplicate records are present in your data at any time. After you have eliminated all duplicate records, click on the Import Data button to the left of the screen, to import your Return Address / Address records fully into the DC Envelope Printer.